Offering you a complete choice of products which include air bubble insulation, air bubble film roll, air bubble sheet, insulation material, air bubble insulation sheet and heat resistance air bubble sheet. Every time you utilize the air bubble insulation as an effective blocking material to stop the heat penetration from outer environment to your home or industrial premises, it pays you back by saving lot on energy consumption that requires maintaining specific temperature inside. The scientific research has clears that such aluminum foil bubble insulation is best for the hotter environment when the temperature difference is very high. The thermal insulation concept of heat transfer is that the hot sun rays are bounce from the surface of aluminum foil and stops hitting the inner environment. Therefore it gives stable heat inside the house with the increase or decrease of temperature outside and saves energy consumption. Reflective air bubble insulation reflects heat and almost 97 percent of radiant heat rays to keep the inner atmosphere at stable temperature. Such thermal resistant bubble insulation material is actually single or multi layer polyethylene air bubbles film coated with aluminum foil or fibers from single or both of the side. The layers of air bubbles are sandwiched between pure and reflective aluminum material. It gives higher strength to the polyethylene film and also the resistance against the punctures and tears. Such thermal roof insulation material is versatile in use as it can be used to covers the roofs, ceilings, crawl spaces, wall and attics and even utilize for packaging purposes. 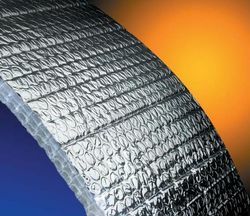 Such radiant barrier film is also used for mobile house insulation. Large scale steel building and concrete structure can also be insulated with multi layer bubble insulation by pre engineered building insulation. One of the greatest advantages of using thermal resistance polyethylene air bubble insulation is that it can be used again and again as far as it remains in comparatively sustainable shape. Application of polyethylene bubble insulation includes similar to fiberglass application and such material can be used in both hot and cold climates. HVAC ducts, steel structure, garage openings, basement walls and radiant roof can be covered with such insulation material. 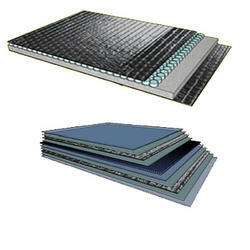 However, different versions of the product like single layer air bubble insulation or double layer air bubble insulation are recommended for various application based on the climate, material of roof, situation and other details. You can use bubble insulation material over the existing fiberglass insulation that has been already applied to improve it's efficiency and prevent unexpected heat gain or loss. Such insulation material is low cost and easy to use. 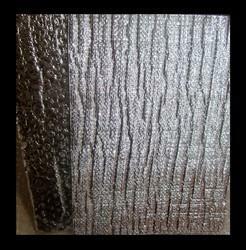 In some cases bubble foil insulation material differs from regular insulation based on it's ability to reflects the sun rays and heat whereas traditional insulation absorbs it. In most of the cases this absorbed heat can pass through the insulation material but such case is not possible in reflective insulation material. An extremely cost effective and efficient approach for insulating any building or concert structure is to cover it with air bubble insulation material. We have emerged as one of the reputed names of this industry engaged in manufacturing and supplying a vast array of Air Bubble Film Roll. Fabricated using optimum grade raw material and latest technology, the surface of these rolls is made as uniform as possible to ensure their proper functioning as a cushioning material. Our professionals make sure that these rolls are made in strict compliance with the latest industrial standards. 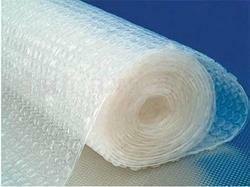 We are engaged in manufacturing, wholesaling and supplying a high quality assortment of Air Bubble Sheet. This product is crafted using supreme class raw material with the help of latest technology in compliance with international quality standards. It provides complete safety of the packed products and ensure safe delivery. We make available this product in various sizes, lengths and other specifications at highly competitive prices. With the help of our highly experienced and qualified professionals, we are offering a wide range of optimum quality Insulation Material to the esteemed clients. Offered insulation material is manufactured by our professional in adherence with the international quality standards & norms. These insulation material are widely accredited in the market for their excellent resistance to highly pressure and temperature. 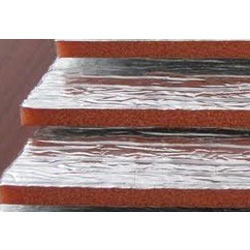 Air Bubble Insulation Sheet consists two layers of air bubble film laminated with one side metalized foil and Poly film on another side. This double bubble insulation material reflects 97 % of radiant heat. We are among the well known company that has gained fame in manufacturing and supplying superlative quality Air Bubble Sheets. These bubble sheets are available in various sizes and designed for different applications. These bubble sheets of our company are acknowledged by our clients due to their remarkable features and excellent impact resistance qualities. Last but not the least these are available at competitive prices. 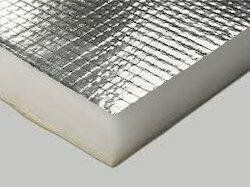 Owing to our competent professionals and robust infrastructure, we have been able to Insulation Sheets. These products are made using optimum-grade raw-material and cutting-edge technologies, in adherence with the industry set quality norms. This range is extensively used for insulation applications in ducts, pipes with large diameters or large surfaces with ease, owing to their superior quality and performance. 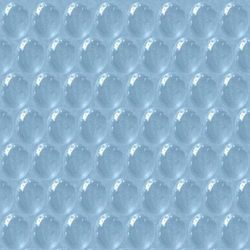 Additionally, we offer this range with ALU facing, self adhesive pattern and colored patterns. Ensures product integrity for temperature sensitive products.